The availability and acceptance of SaaS model technologies, means that cloud apps, specifically cloud CRM apps, are big business. As the first to market, Salesforce maintains the majority share holding. However, the past 16 years have seen it languish in its position as top dog. What is it they say? Complacency is the enemy of empires. At what point does full functionality become too much functionality? Well it appears Salesforce passed this threshold some time ago. Number two on our list of Salesforce customer grievances – complexity. It seems somewhere along the way, Salesforce lost sight of the core functions of CRM, at the very basic – contact management. If your customers can’t get to grips with the basic functionality of your system, how can they be expected to maximise the potential of the product? As a company responsible for breaking the mould, you would hope Salesforce would pride itself on being responsive and supportive of smaller, growing businesses. Though past years have seen Salesforce solely target enterprise accounts with varying success. The biggest complaint we get from salespeople who have migrated from Salesforce is its usability. After years of building and adding features to a once streamlined system, Salesforce has become the untamed beast of sorts. The power and functionality is there sure, but no one knows quite how to manage it. Salespeople revolt on the basis they spend more time feeding their CRM than their primary job function – selling! What’s the #1 functionality salespeople want from their CRM? To help them sell of course! Step forward, OnePageCRM, Salesforce’s, smarter, (better looking) and more agile younger brother. We’ve learnt a lot from our predecessors over the years, making sure to avoid the pitfalls of rapid success. At OnePageCRM, we’ve built a streamlined system, with core functionality that actually helps you sell more. We pride ourselves on our simplicity, knowing every feature update we introduce is crafted on the feedback of our customers – salespeople. We understand that the secret to sales isn’t charts and graphs, it’s sales actions. That’s why our Next Actions Sales and Action Stream are so effective. What’s more, we offer full functionality from day 1, with no surprise opt-in’s later in the funnel, one system, one price. And what our customers are saying about us? Thanks for commenting and for your feedback. Would love to hear how you’re getting on if you need any more assistance: support@onepagecrm.com. 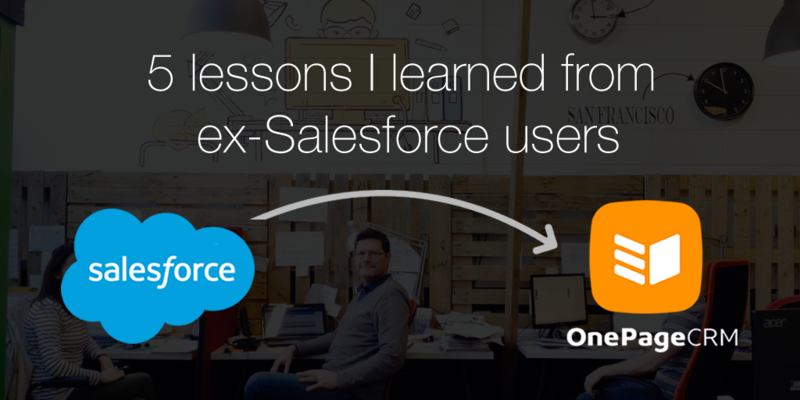 Thanks for introducing the hidden pitfalls of salesforce..
Glad you enjoyed the article, just a couple of things to be aware of when choosing a CRM for your business!